Aurora is an innovative, compact, flexible and affordable single and/or multiphoton light sheet fluorescence imaging system for rapid, large 3D volumetric imaging, high resolution, multicolour, time-lapse imaging and live cell imaging. Airy beam Light Sheet Microscopy (ABLSM) is an increasingly popular imaging modality for visualising whole samples, such as embryos and organoids, and is used for the longtime observation of embryonal development in different model organisms in developmental biology, cell biology, neuroscience and regenerative medicine. Aurora is already being used out in the field by many leading organisations with outstanding results. Thanks for your enquiry, we will be in touch as soon as we can. 2 adult C. elegans specimens expressing fluorescent protein in their body wall muscles. Original dataset was 600x600x600 micrometers. Strains courtesy of Dr Serena Ding, MRC London Institute of Medical Sciences. Samples prepared by Dr Muna Elmi, University College London. Images captured by Dr Mike Shaw, National Physical Laboratory. *2 3D volumetric projection of a Meristem (leaf shoot) of an Arabodopis plant expressing GFP-CHDR5 (Magenta) overlaid with the plant’s native autofluorescence (Cyan). Original dataset was 600x600x1,000 micrometres. Image courtesy of Tom Timmers, Max Planck Institute for Plant Breeding Research. *3 3D volumetric projection of a stitched dataset of 3 Z-stacks. It shows a living 2-day old zebrafish from head to tail mid-body, labelled with GFP-sox17 (Cyan) and RFP-prox1(Yellow). Original dataset was 1,700x600x400 micrometres. Image courtesy of Professor Lene Broeng Oddershede, Dr Younes Farangebarooji and Dr Elke Ober, Niels Bohr Institute Copenhagen. *4 3D volumetric projection of a live 2 Day Old Zebrafish Tail, labelled with GFP-sox17-cyan, RFP-prox1-magenta. Original dataset was 600x600x400 micrometres. *5 Progression through a Z-stack of a 1 week-old Zebrafish Larvae with Transgenic Expression of GCaMP in the brain. Original dataset was 600x600x400 micrometres. Image courtesy of Thomas Shallcross and Thomas Sainsbury, MRC Centre - Developmental Neurobiology, King's College London. 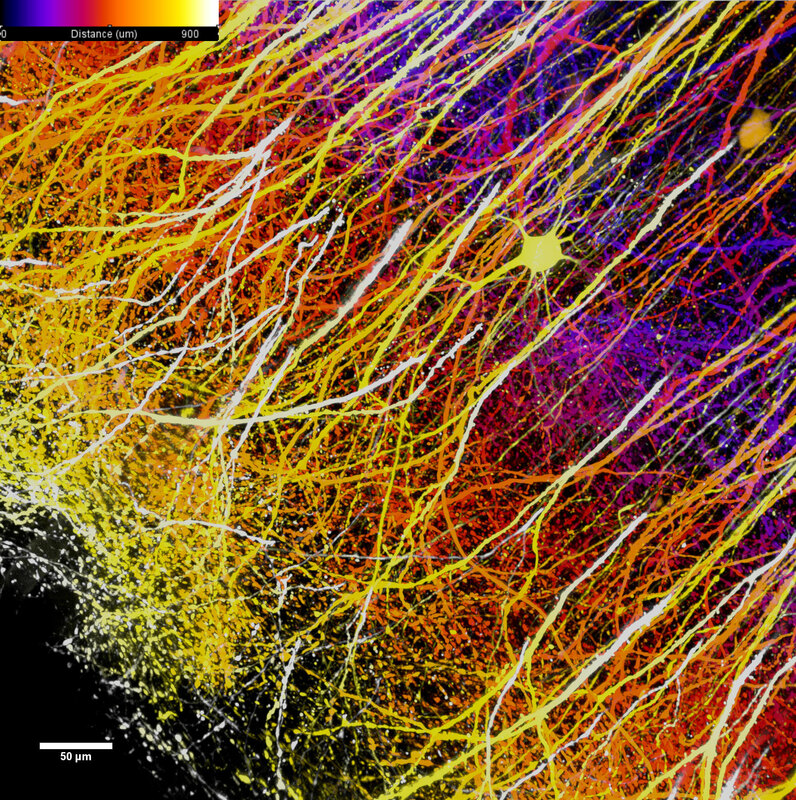 *6 3D volumetric projection of an optically cleared mouse brain expressing thy1-GFP Actin. Original dataset was 600x600x200 micrometres. Image courtesy of Dr Anthony Vernon and Robert Chesters, Department of Basic and Clinical Neuroscience, Maurice Wohl Clinical Neuroscience; MRC Centre for Neurodevelopment Disorders, King's College London. *7 3D volumetric projection of mouse hindbrain expressing GFP- CX3CR1 (Green) overlaid with the native autofluorescence (Magenta). Original dataset was a multi-photon excited volume of 600x600x200 micrometres. 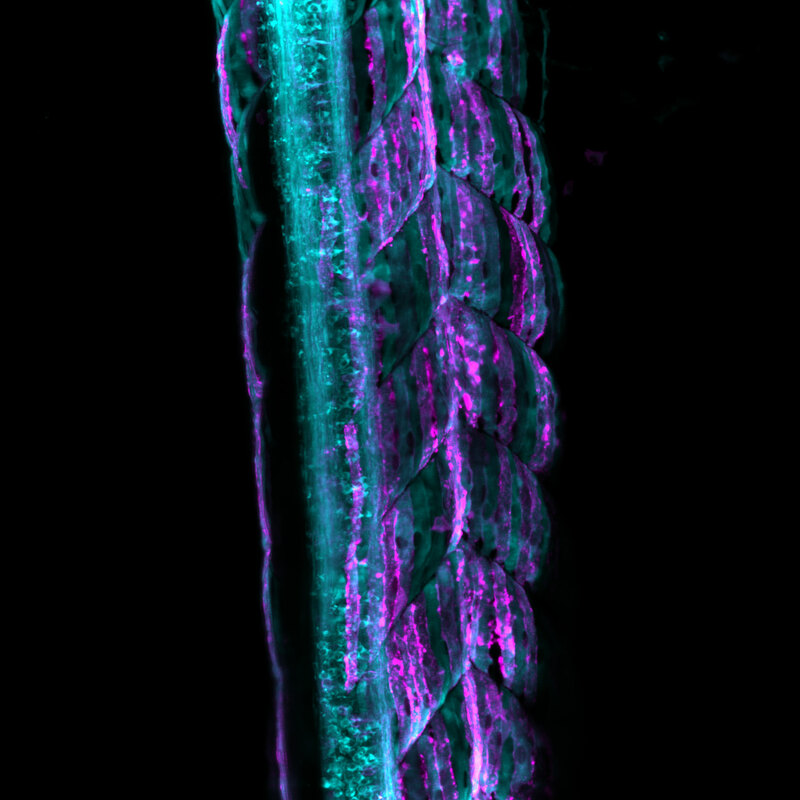 *8 Maximum intensity projection of a living 2-day old zebrafish tail, labelled with GFP-sox17 (Cyan) and RFP-prox1(Magenta). Original dataset was 600x600x400 micrometres. 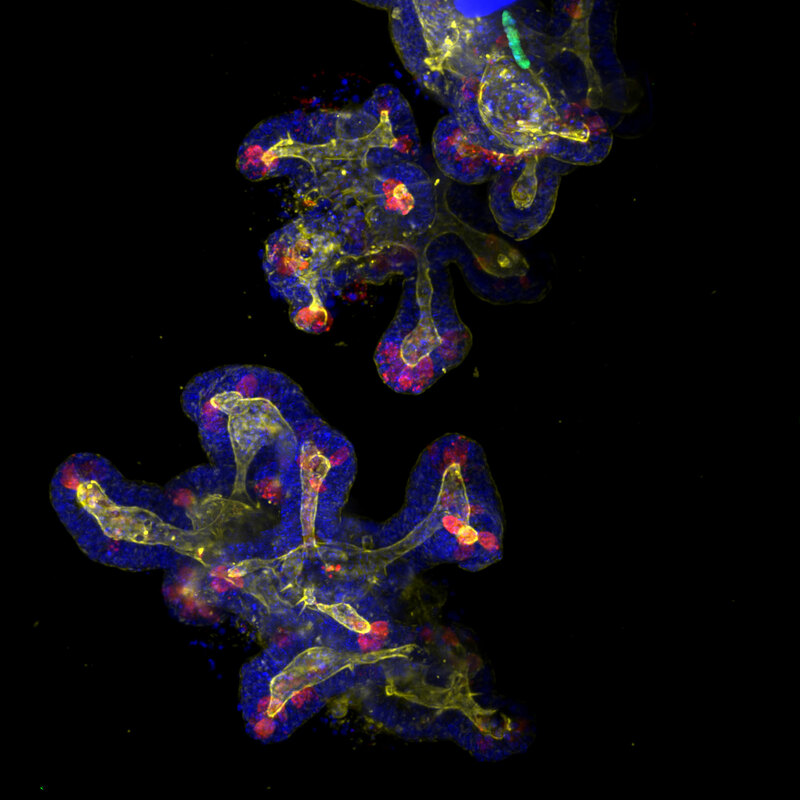 *9 Maximum intensity projection of 2-week old mouse intestine organoids labelled with 4 colours. DAPI staining the nuclei (Blue), AF647-Phalloidin staining Actin (Red), AF555-WGA staining the Paneth cells (Yellow), and GFP-LGR5 expressing in the stem cells (Green). Original dataset was 600x600x200 micrometres. Image courtesy of Dr Sandra Scharaw and Dr Sylvie Le Guyader, Karolinska Institute, Department of Biosciences and Nutrition. *10 Maximum intensity projection of an optically cleared mouse brain labelled with Alexa 488-Neurofilament (Cyan) and Alexa 568-Parvalbumin (Red). Original dataset was 800x800x1,000 micrometres. 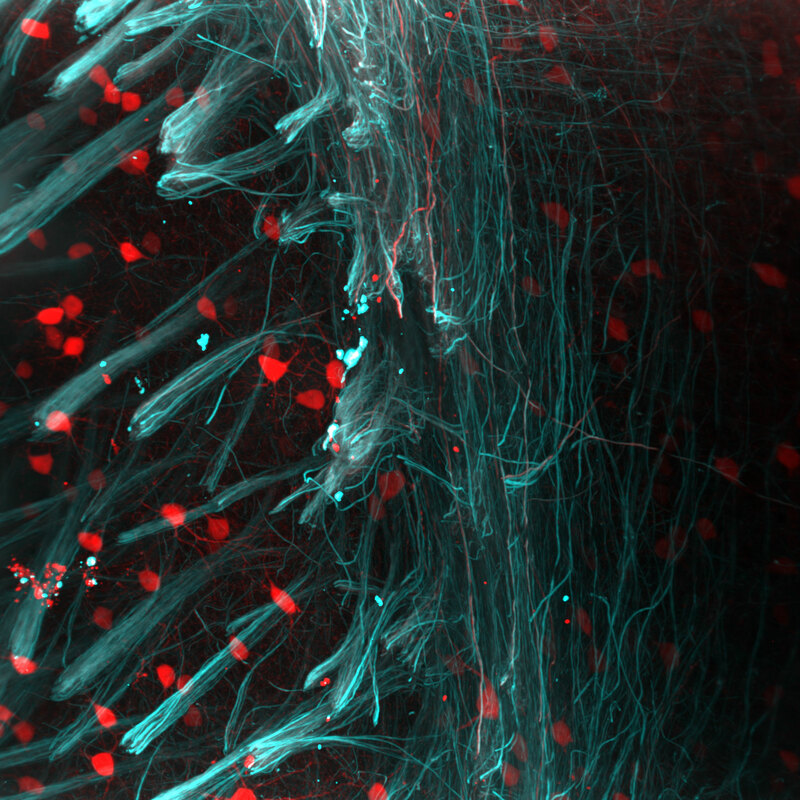 Image courtesy of Adam Tyson, MRC Centre Developmental Neurobiology, King's College London. 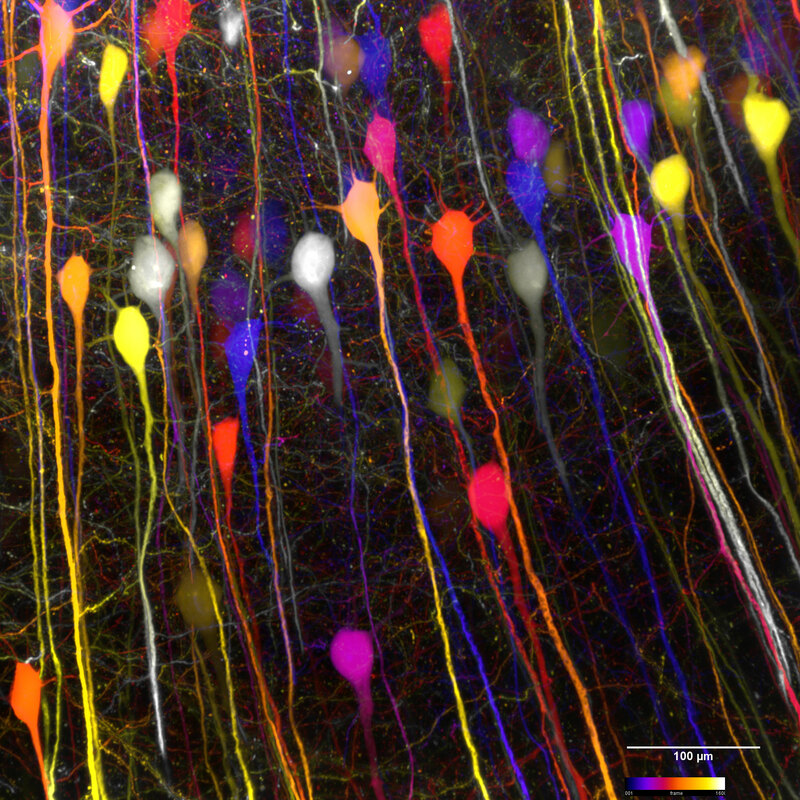 *11 Maximum intensity projection of an optically cleared mouse brain expressing thy1-GFP Actin using a coloured height map. Original dataset was 600x600x640 micrometres. *12 Maximum intensity projection of an optically cleared mouse brain expressing thy1-GFP Actin using a coloured height map. Original dataset was 600x600x1,000 micrometres.